Ayden had a rough night last night. Every now and then he will have a night where he'll keep standing up and asking to be covered back up... even though he was covered until he stood up. He'll lay there just long enough for us to drift back to sleep and then he'll stand up and do it again. He did this for about an hour and I think that is what made us so tired. It's nights like those that make me wonder if he'd do better in his own room without us right there to talk to. On the other hand, it makes me wonder how many times I'd be getting out of bed to tend to him on those nights if he wasn't right next to our bed. The good thing is that these nights are few and far between and the majority of the time he sleeps just fine with our current arrangement. After a rough night, I was tired and grumpy this morning. It took me a while to get out of the funk but once I did I enjoyed the day. Ayden and I ran a couple of errands and then I spent a couple of hours cleaning for my mom's homecoming while my dad played with Ayden. Then we came home for lunch and Ayden's nap (during which I put dinner in the crock pot and had some downtime and painted my nails. In hind sight I should have napped too). I woke him from his nap, put him in the car and went to the studio to teach my Wednesday dance classes. From there we went straight to a visitation for my great uncle. While I was there my dad got my mom home safe and sound. I left the funeral home and went straight to their house to sit with my mom while my dad went and got her prescriptions filled and picked up some pudding, popsicles and such. We stayed there until almost 9:00 and left right when my dad got back. We were both TIRED. 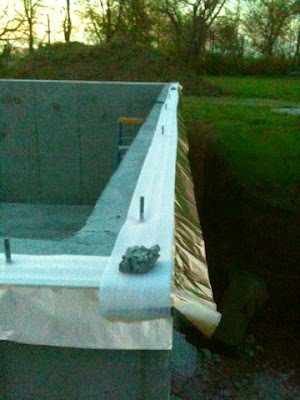 A layer of foam sill sealer, a layer of copper termite shield and another layer of the foam. The next step will be for them to install the sill plates. Now that my mom is home I am realizing how taxing the daily drives to the hospital were. Now she is just a hop skip and a jump away and it is such a relief. I know she will be more comfortable and all of us will be too. Having Ayden in that tiny hospital room with all of those tempting buttons was hard work for sure... He called the nurse's station a good 8 times over the course of my mom's stay. He's lucky he's so darn cute, they all loved him and never cared a bit. Flashback! Here's what we were up to one year ago today: "Bee Count Down"
And two years ago today: "Another Piece To the Puzzle"
My pediatrician told me not to have child in room with us because it causes sleep conflict with child. It sounds like your son needs a little discipline if he is over 2 and behaving in such a way. I recommend ignoring him and not tending to him every time he wakes up, especially at his age. He will become spoiled over time. It happened to me with my child. I know better now. Try to get him in his own room. He needs his own sanctuary and you and your husband can enjoy each others company without whispering when he's sleeping. Try to do it fast or he will be sleeping in your room at 5. Every family has to find what works for them. Thanks for the advice. You are lucky to have the option of putting him in his own room. I would do that in a heartbeat if I could. We have a one bedroom apartment an have our mattress in the living room because our toddler sleeps better without is in there. Blackout curtains plus a white noise machine in his own room = a blissful night's sleep. My son doesn't sleep well at all and he's 3. He sleeps in his own room most nights but other nights he ends up in the bed with us. Either way, it doesn't seem to effect his sleep good or bad. I think it's just something children seem to go through or at least some of them. I truly believe that every child is so unique that they each deserve their own plan of action as far as sleep goes.There just isn't a blanket solution. I honestly feel like Ayden, like your son, would sleep the same no matter where he was. I agree with you and think that is is just a phase that some kids go through sometimes.